Misericordia University students who recently graduated from the Bachelor of Science degree program in nursing (BSN) achieved a pass rate higher than the state and national averages on the National Licensure Examination for Registered Nurses (NCLEX-RN) for baccalaureate degree students. The NCLEX-RN was developed by the National Council of State Boards of Nursing (NCSBN) to ensure the public's protection. In order to receive a license to practice, a nursing candidate must pass an examination that measures the competencies newly licensed, entry-level nurses have to perform safely and effectively, according to NCSBN. Misericordia University BSN graduates achieved a 95-percent pass rate for first-time test takers between October 2017 and September 2018. Misericordia graduates exceeded the average national pass rate of 88.56 percent and the average pass rate in Pennsylvania of 92.84 for baccalaureate degree programs. Misericordia University NCLEX-RN test-takers also had the second highest pass rates of baccalaureate-degree programs in Luzerne and Lackawanna counties, according to NCSBN data. "Misericordia University has a long tradition of preparing clinically proficient nurses who provide compassionate care to their patients,'' said Annette M. Weiss, Ph.D., R.N., C.N.E., associate professor and chair of the undergraduate nursing program. "The successful completion of the licensing examination is a direct reflection of our nursing students' hard work and determination, and our faculty's expert guidance to help them be the best possible nurses in the health care field,'' added Brenda L. Hage, Ph.D., D.N.P., C.R.N.P., assistant dean of nursing and chief nurse administrator. Misericordia University features the oldest nursing program in the area and graduates more students in the health sciences than any other college or university in Northeastern Pennsylvania. 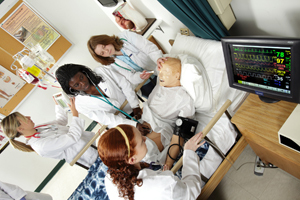 The University offers three undergraduate nursing programs: traditional, full-time nursing students; part-time evening program for adult students; and the RN to BSN Expressway Program. The undergraduate nursing programs are designed to meet the special educational and scheduling needs of adult and traditional students. They all lead to the Bachelor of Science in Nursing (BSN) degree. The MSN nursing program meets the special needs of current BSN registered nurses who desire an advanced practice specialization as a family nurse practitioner. MU also offers a post-master's certificate as a family nurse practitioner for nurses who already have an advanced clinical master's degree and who wish to change or expand their practice focus to primary care. Nurse practitioners are registered nurses with advanced education in health assessment, diagnosis and management of acute and chronic health conditions with expertise in health promotion and disease prevention. Graduate programming leads to the MSN and provides course work in a convenient part-time, one-day-a-week format. The University also offers an online Doctor of Nursing Practice degree program in two formats to accommodate the needs of busy health care professionals and in response to growing national need. For more information about the nursing program at Misericordia University, please call (570) 674-6400 or visit www.misericordia.edu/nursing. Misericordia University students, testing their clinical skills above in the Erwine Nursing Lab in John J. Passan Hall, recently graduated from the Bachelor of Science degree program in nursing and achieved a pass rate higher than the state and national averages on the National Licensure Examination for Registered Nurses for baccalaureate degree students.